It only took a day for my incipient Petoskey stone-love to grow into an all out Petoskey stone-OBSESSION. Shocking, I know - totally out of character for me, yes? 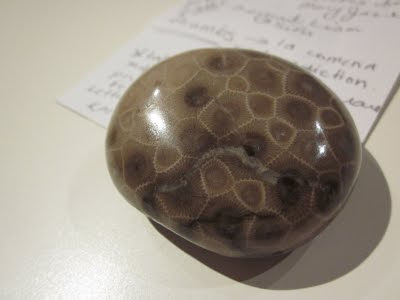 Petoskey stone-acquisition occurred a mere day later, at an odd little rock shop fittingly located in Ypsilanti, MI. After all, the Petoskey stone is Michigan's official state stone. I am quite taken with my little piece of the Devonian period. I can only hope that I look as good on my 350 millionth birthday. O, I love them too! There's a whole beach full of them just south of Charlevoix, but we find little chips of them way down in Saugatuk! Yours is a beauty. August 21, 2011 at 9:17 a.m.
Beautiful - would make a nice mitt pattern... just saying I see inspiration it this little rock. August 21, 2011 at 10:25 a.m.
Forgot all about these stones until I saw your post. We vacationed in Michigan as a kid and use to go to a beach to pick these up! Thanks for the good memory! August 21, 2011 at 12:04 p.m.
We have friends here in Florida who are from Petoskey and live there in the summertime. They gave my kids a book "The Legend of the Petoskey Stone" that may interest you, although there are probably some grown up books on the subject, too. I agree with love2stitch - I see "Pesocksey's" in your future! August 21, 2011 at 2:18 p.m.
August 22, 2011 at 9:24 a.m.
Ohhh, yeah . . . a mitten pattern. August 22, 2011 at 12:13 p.m.
August 22, 2011 at 7:48 p.m. I have little stashes of rocks that I have collected on our trips scattered throughout the house. I only very recently thought that I might give them a nice little polish. This stone of yours is stunning and I now have the urge to visit Michigan. is it okay to be envious of someone's stone? August 23, 2011 at 7:47 a.m.
August 24, 2011 at 9:17 a.m.
a waitress at a local cafe has a gorgeous petoskey pendant. i was jealous! September 6, 2011 at 2:43 p.m.